Lately we’ve been thinking a lot about the Anna Sui Butterfly tunic for Fall. 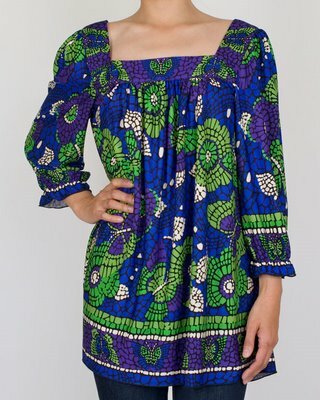 Having this vibrant piece now is assurance that you won’t be feeling the winter blahs in the months to come. We love it under a leather bomber or motocycle jacket with jeans, and if you’re petite, you can get away with wearing it as a dress with super high loafer wedges. If you feel like there’s too much volume on top, it looks really fantastic with one of our Ada leather wrap belts. Start planning your Fall and Winter wardrobe, and include lots of color! posted by Josef Boutique	on Monday, July 27, 2009 at 11:28 am.